Every Easter, our family has an outdoor picnic at our aunt’s house. It’s been a tradition for many years. We have great food, an Easter egg hunt, games, and more. And for the last few years, Anna has had to stay inside to eat. It’s just too difficult to eat with mittens and a big plastic shield over your face. She would come out with her gear after lunch, but during much of the party she’d be stuck inside. 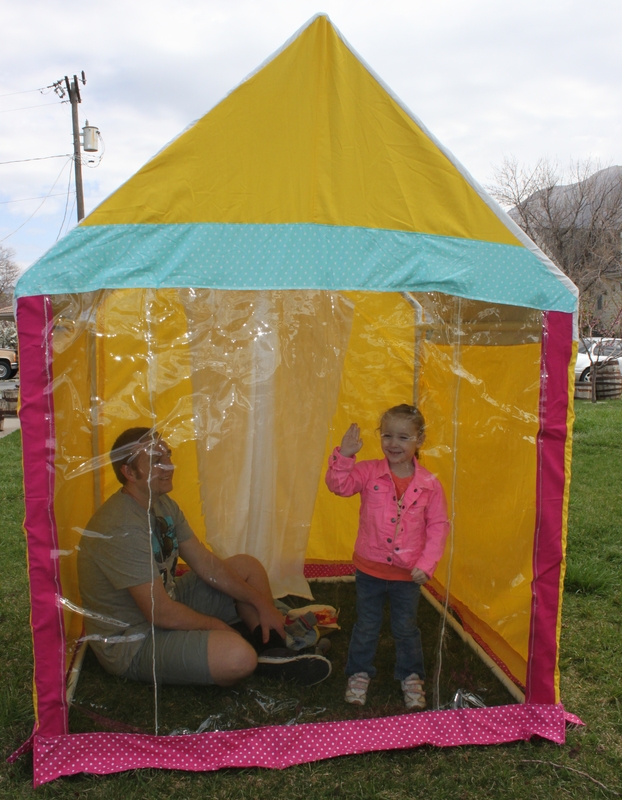 A few weeks ago, Anna’s aunt Sophie found a fun PVC outdoor playhouse design online. 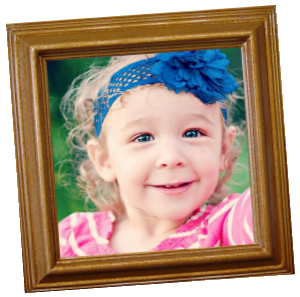 She had a brilliant idea to modify it so it could be a UV-free play area for Anna. We agreed and Sophie started planning . 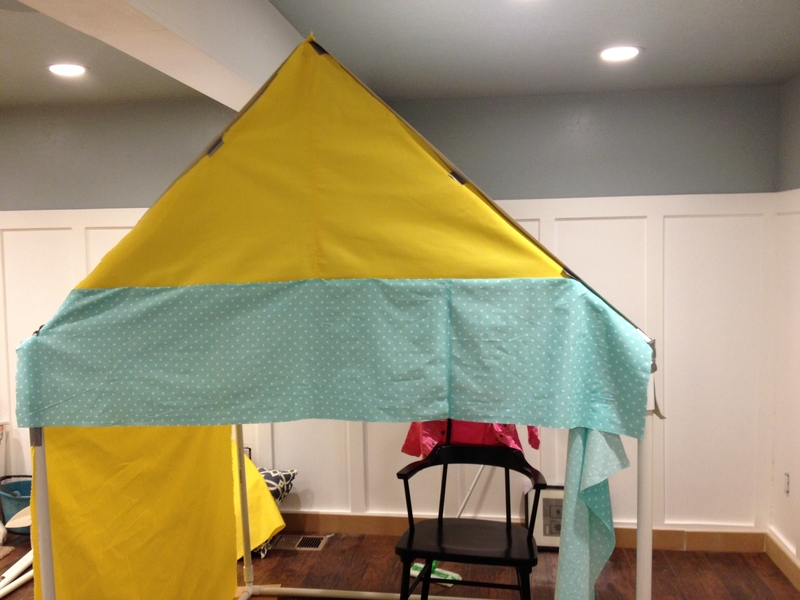 Anna’s mom and Sophie went to the fabric store and picked some UV-blocking cute fabrics to make the tent. PVC was purchased. And just a few days before the Easter picnic, Sophie teamed up with her dad (Anna’s Grampa B) to put it together. Sophie and Grampa B hard at work. 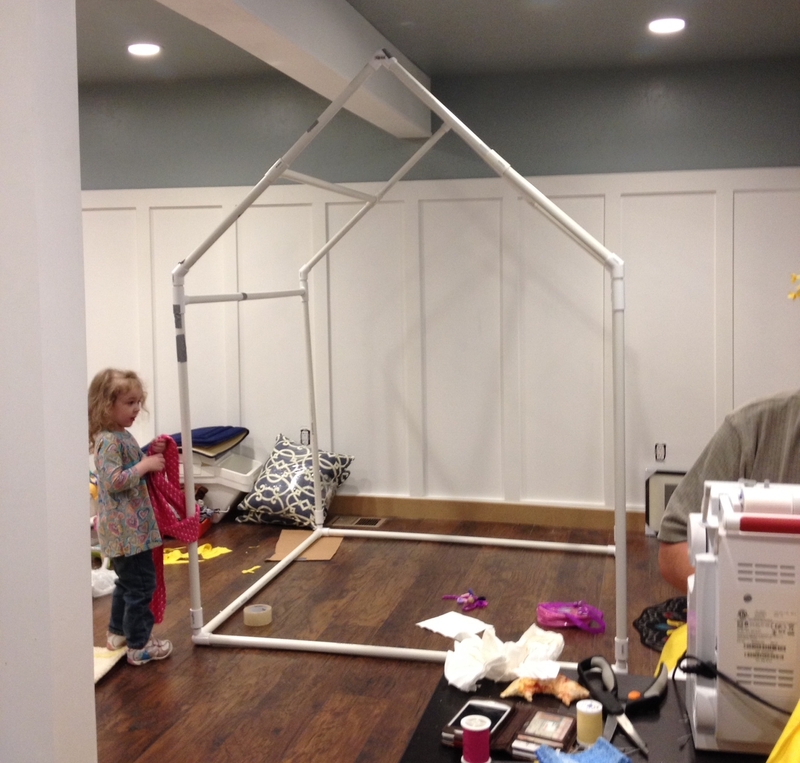 Sophie and Grampa B worked tirelessly for 2 or 3 days (or more) to build the tent. They worked almost all day each day on it! 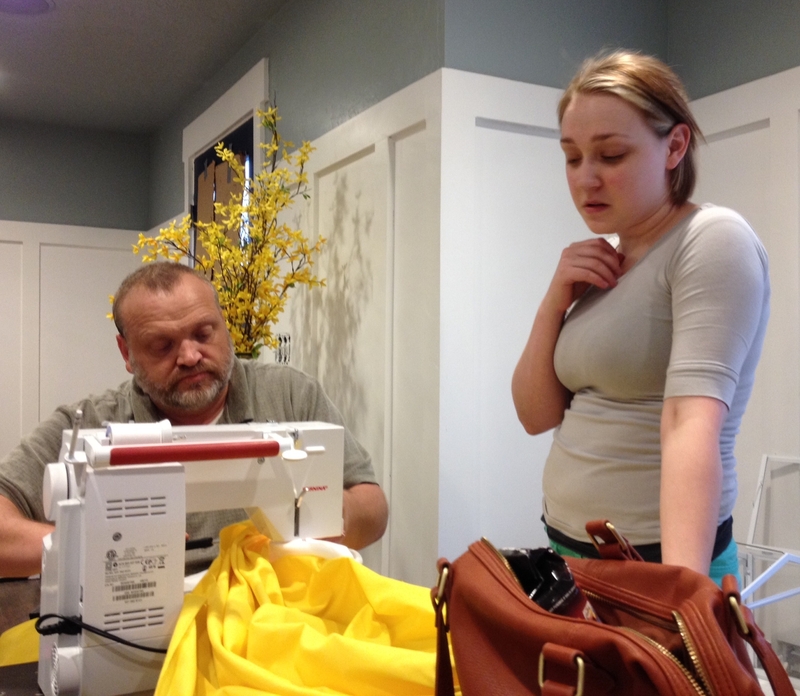 Sewing, modifying, sewing, cutting, sewing, ironing, sewing, testing, and more sewing. We provided some pizza and moral support. 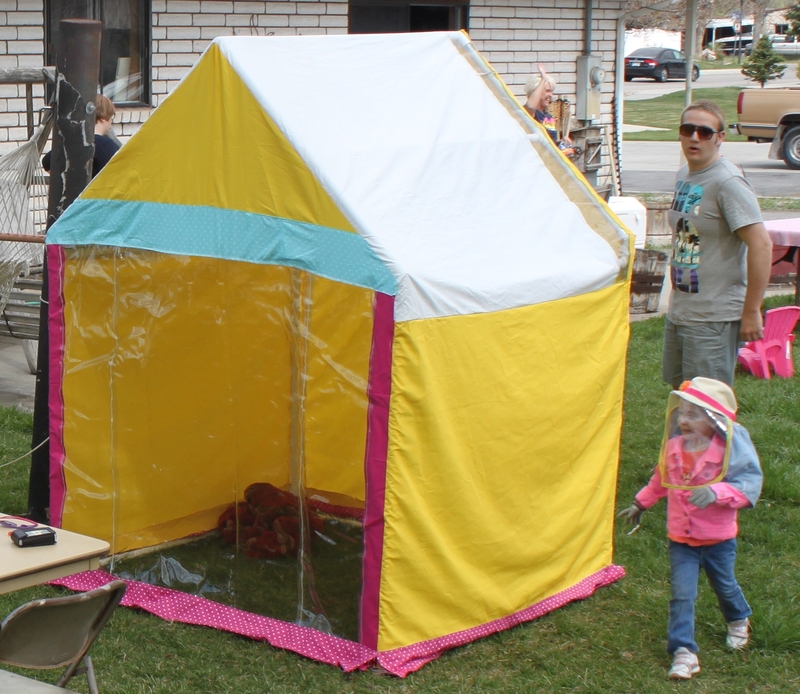 The day before our Easter picnic, the tent was finished! Sophie paid careful attention to make sure no unsafe sunlight would get in the tent. She added a cute border around the bottom. 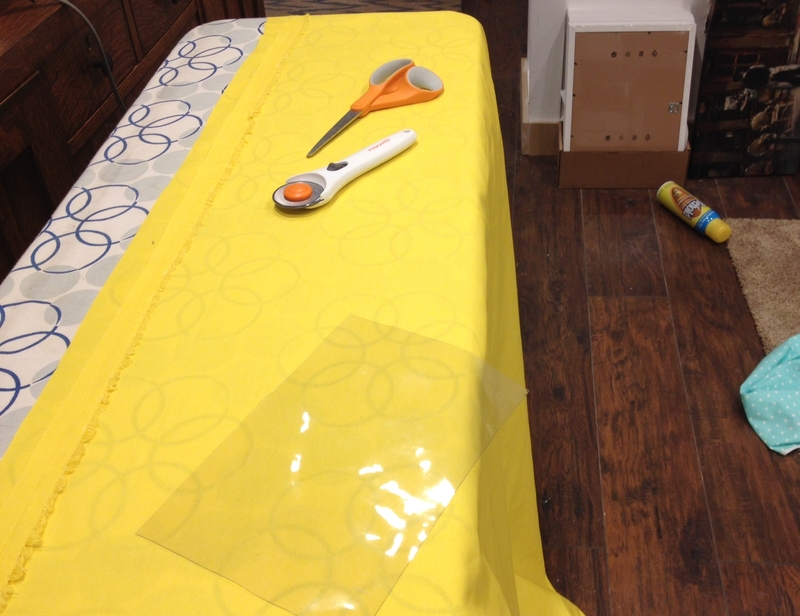 A strip of UV-safe plastic was added to the roof to let more safe light in the tent. They added a double-layered curtain behind the entry to keep it safe. it was beautiful and safe! Anna running around her new tent. Anna entering her play tent for the first time. Anna and her cousins having fun! Anna, hanging out with uncle Bridger, waves hello! Anna had a great time in her tent. 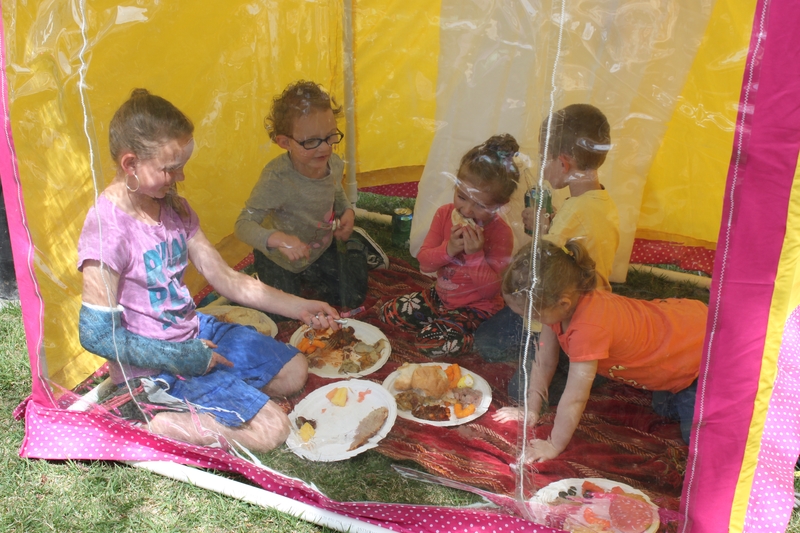 The best part was that her cousins joined her in the tent for the picnic! It was a hit for Anna and for her cousins, too. 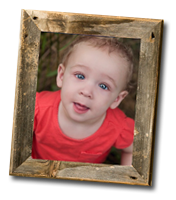 We look forward to many picnics and outdoor activities with our new, amazing UV-safe play tent. A HUGE thank you to Sophie and Grampa B for their hard work! We love you and appreciate all you do! Sophie, her baby, and Anna pose in front of the tent.